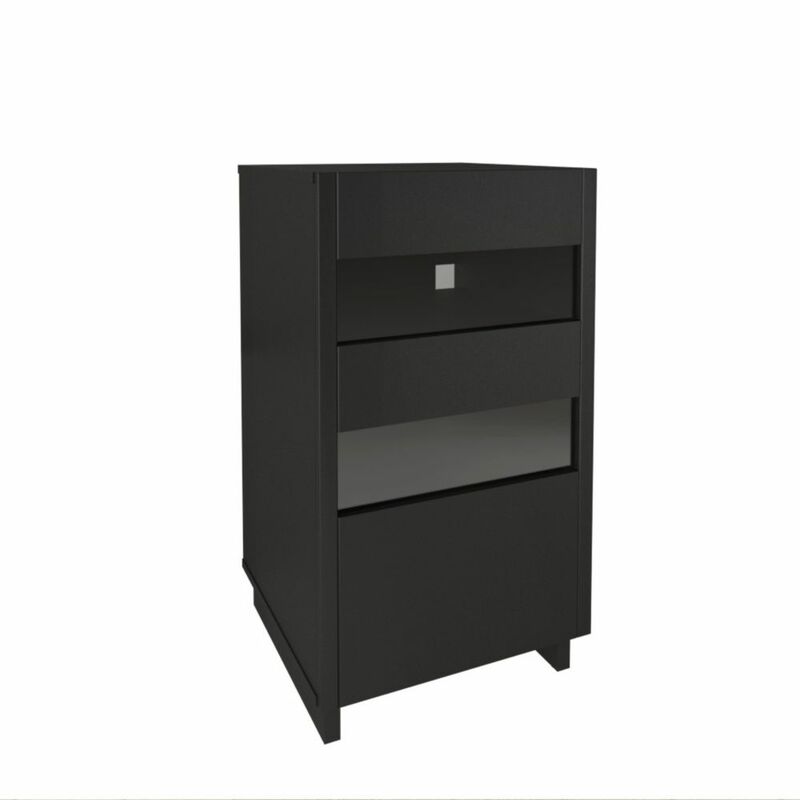 Vision Audio Tower from Nexera features 2 adjustable shelves and a reversible door with glass inserts letting you store your electronic devices away from dust. The unit also features a solid and removable back panel allowing for easy cable management and air circulation. Vision Entertainment Collection is loaded with smart features and offered in a rich contemporary black textured lacquer and melamine. Pair Vision TV Stands with matching Audio Tower for a complete entertainment set. 2 adjustable shelves behind door with glass inserts, perfect to keep your electronics away from dust. Solid and removable back panel allowing for easy wire management and air flow. Adjustable levelers. Rather than heading out to the cinema, stay home instead for a movie night with friends! Although your flat screen may be showcasing the latest blockbuster, the Morello Collection underneath might be stealing the show. Clean lines and open shelves storage make up for this great collection while the timeless Truffle finish complements well your living room with its rustic-chic style. Vision Audio Tower from Nexera Vision Audio Tower from Nexera features 2 adjustable shelves and a reversible door with glass inserts letting you store your electronic devices away from dust. The unit also features a solid and removable back panel allowing for easy cable management and air circulation. Vision Entertainment Collection is loaded with smart features and offered in a rich contemporary black textured lacquer and melamine. Pair Vision TV Stands with matching Audio Tower for a complete entertainment set.